Online platform that helps groups of people with shared interests to plan offline group meetings around the world. In it's current model, it only caters to organisers and members. User surveys, interviews, leadership of the project, experience map, contextual research, usability testing, persona creation, wire framing and prototyping. The project was part of training at GA. It was completed in two weeks with key-learnings: writing of survey forms, making forms for website easy and simple to use, project management. The competitive environment was mapped by studying the number of steps involved in the process of listing venues on their website. Compared the service of direct competitors to that of Meetup as well. Eventbrite offered a free service compared to Meetup with plenty of apps such as entry manager etc. The research involved both a survey and personal interviews to understand how the organisers are finding space for their meetups and how are the companies marketing their space at the moment. The survey was responded to by 86 people and brought to light some key insights into the process. On interviewing close to 10 people- 6 organisers and 4 space owners, the findings from survey were further validated. 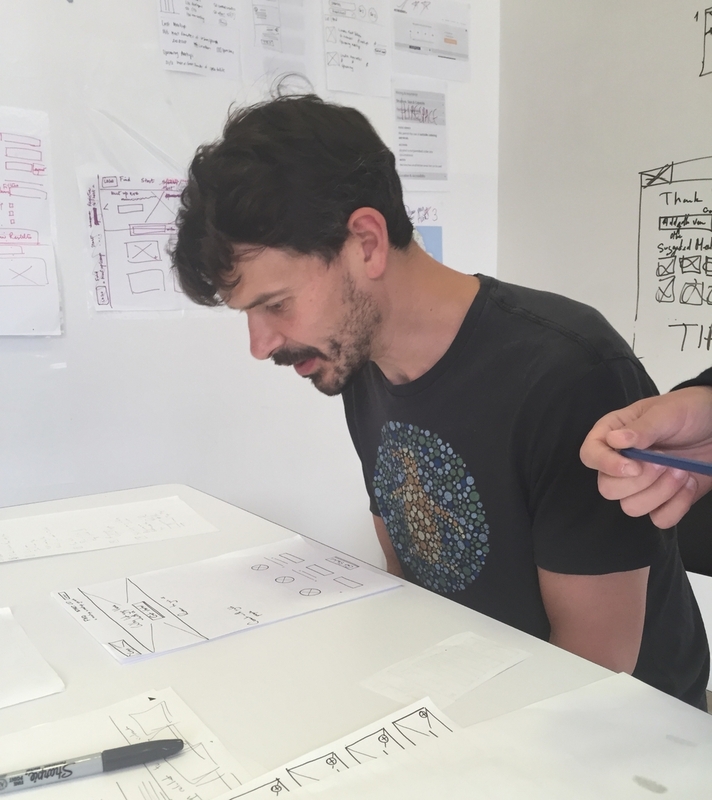 The design process began with understanding the user by making an user flow and experience map. 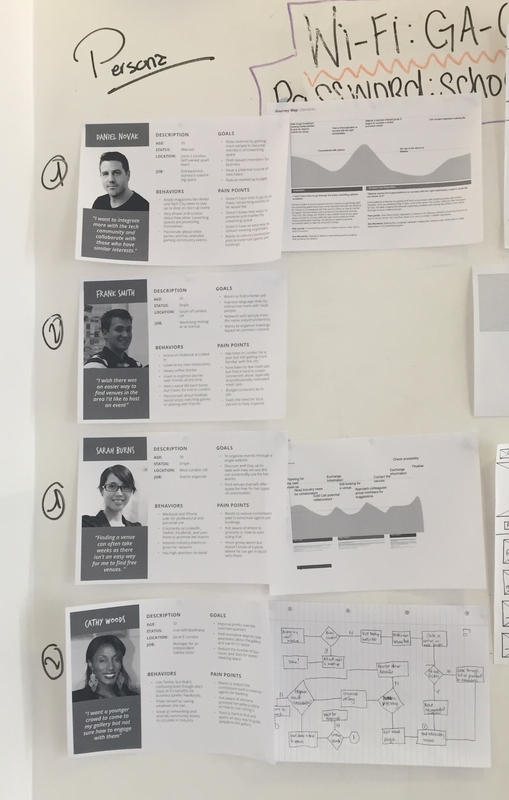 Based on all this research, personas were drawn to keep in mind who we are designing for, what their pain points are and how they behave. First-time event organisers found it difficult to search for venues that were free and wanted to collaborate for a meetup. One of the interviewee’s had spent close to two months looking for a venue, when starting a meetup for the first time. Other’s who were organising meetup’s regularly found it difficult to look for new venues that were also free and were willing to collaborate. Usually, they were cold calling potential collaborators and only succeeded in finding one when suggested by colleagues or Meetup group members. Space owners found it difficult to list space online, felt overwhelmed with options online and when they discovered Meetup, the problem is that there is no way for them to list their venue. The minimum viable product must allow organisers to find venues easily within their preferred area & venue owners to list their space online easily. The first sketches included the basic sign-up form for a company to list their space online which was in the same format as the Meetup website. Testing revealed that the users found the form complicated. The key information filled by venue manager was not matching with the information available to the organiser on search. The user was getting confused by the words ‘find a venue’ listed in the primary navigation. Why not add the venues into the central search bar? Incorporating all these findings into the next iterations, final mockups were prepared. The final designs developed an easy to use feature that will test inclusion of venues within Meetup’s current model.